SCOTTSDALE, Ariz. – Dec. 29, 2017 – Barrett-Jackson’s prestigious 2018 Salon Collection, presented by E.D. Marshall Jewelers and Ulysse Nardin, will usher in the new year with some of the finest examples of the world’s most coveted collector vehicles during the 47th Annual Scottsdale Auction, January 13-21, 2018, at WestWorld of Scottsdale. From extremely rare and historic, to the best examples of custom builds and modern luxury performance, the 2018 Salon Collection includes a 1914 Rolls-Royce Silver Ghost (Lot #1378.1) and a matching-numbers 1966 Aston Martin DB5 (Lot #1389). Highlights of the 2018 Salon Collection include a ’66 Aston Martin DB5 (Lot #1389) featuring its original rebuilt matching-numbers 4-liter 282hp engine mated to a ZF 5-speed manual transmission. A one-of-a-kind 1951 Talbot-Lago T-26 Grand Sport Saoutchik Coupe (Lot #1381), acknowledged as an automotive work of art, was touted as the fastest touring car built in France in its day. 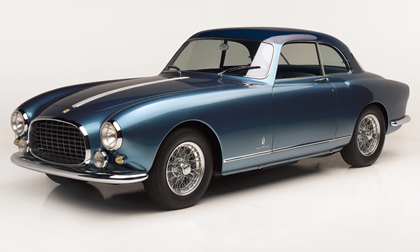 A ’52 Ferrari 212 Europa (Lot # 1378) is the third of only 11 212 coupes built by Pininfarina. Beautifully restored, it has an extensive pedigree of awards and honors, including a perfect 100-point score at the Pebble Beach Concours d’Elegance. Among the prewar classics set to cross the block in Scottsdale is a 1914 Rolls-Royce 40/50hp Silver Ghost Landaulette by Barker (Lot #1378.1) is a legend credited for beginning the Rolls-Royce tradition. It is the last of the 116 B-Series Silver Ghosts produced and is still in its original elegant and handsome Barker-bodied landaulette configuration. A beautifully restored 1934 Packard 1101 Cabriolet (Lot #1380) features a 320ci Straight-8 engine with a 4-speed manual transmission. The complete 2018 Barrett-Jackson Salon Collection presented by E.D. Marshall Jewelers and Ulysse Nardin can be viewed by clicking here. The 2018 Scottsdale Auction docket is now available to view online. Click here to consign a vehicle or visit Barrett-Jackson.com/Bid for information on becoming a bidder. Advance tickets, three-day ticket packages and information on VIP Packages are available at Barrett-Jackson.com. Also, follow Barrett-Jackson on Facebook, Instagram, LinkedIn and Twitter for the latest news and information heading into the 2018 Scottsdale Auction.